As I write this article, news has surfaced that the Freedom and Justice Party (FJP), the Muslim Brotherhood’s political wing, will not use the Brotherhood’s famous motto “Islam is the Solution” in their political campaigns. Last week, the High Elections Commission issued a ban against the use of religious chants, symbols or slogans in the upcoming parliamentary elections. Instead the FJP will campaign using its own slogan “We bring good for Egypt.” As a staunch liberal who personally favors separating religion from politics, I wholeheartedly commend the party’s decision. For years, many Egyptians have opposed the Brotherhood’s slogan, arguing it breeds sectarianism, monopolizes Islam, and violates the Constitution. 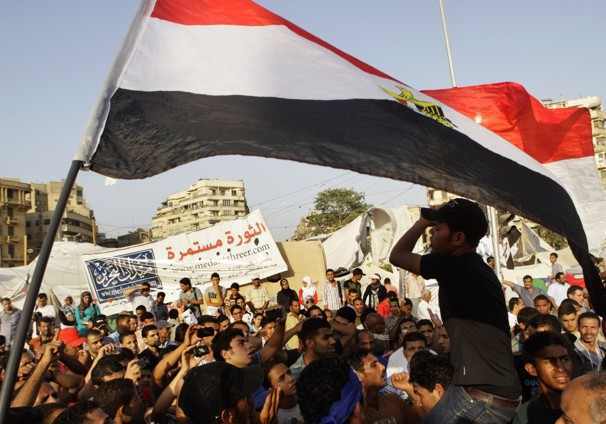 Prior to this decision, the Brotherhood had vehemently upheld its right to use the religious slogan, arguing that it was compatible with the Egyptian Constitution. However, one of the better arguments in support of the use of religious slogans came from a fellow blogger named Hatem Rushdy, whose argument was based not on religious convictions, or legal constraints, but surprisingly, from a liberal standpoint. Please find Mr. Rushdy’s blog in the reference section below. Rushdy was right of course. Legality disputes aside, and in a purely theoretical context, FJP’s right to campaign using religious slogans would fall under freedom of expression. If Liberals would practice what they preach they would not support the censorship of any person or party from the right to express itself simply on the grounds that they find it offensive or disagreeable. Mr. Rushdy provides several arguments in his blog and then systematically challenges a series of counterarguments. His most compelling contentions stem from his opposition to censorship although he does contradict himself slightly when he opposes concerns that religious slogans may confer political manipulation. Here the author argues that these concerns assume a gullible, naive electorate which he rejects because he finds it offensive. I disagree with him and I will explain why in another blog post. But while Rushdy’s arguments remain valid, his hardline Libertarian approach will not come without a cost. Once you take that position there are no exceptions, you can’t pick and choose. In a majority Muslim country like Egypt, this means you have to hold your ground on more controversial issues such as homosexual rights, the right to change religion etc. But Egyptian Liberals are not like that. Both Muslim and Christian Liberals in Egypt have taken a road that reflects their religious, cultural background. We embrace Islamic Jurisprudence (Sharia) as the principal source of legislation enshrined in Article 2 of the Constitution provided it is not abused. We oppose the offensive depiction of Islam in the name of free speech, yet welcome constructive criticism of Islamic issues. And as Egypt turns a dangerous corner we oppose the use of religious slogans in heated election campaigns that could be offensive to some people and risk sectarian confrontation. In Austria, for example, pro-Christian election slogans such as “The West in Christian Hands” were used by the far right Freedom Party of Austria (FPÖ). The campaign slogans were regarded as particularly offensive to the Muslim minority, and were denounced by the religious communities in the country. The issue provoked an attack by the President for what he called “a violation of the consensus to keep politics and religion separate while respecting both”. In contrast to Austria, where the right to campaign using religious slogans is protected by free speech, Egyptian Liberals display a more socially responsible implementation of their ideology, not double standards. Elsewhere in Europe, there is a policy that bans or disciplines parties that have clear anti-democratic values or values that are deemed racist (in Egypt’s case that would translate to sectarian). Therefore, depending on how liberal the democracy is, religious slogans may fall under freedom of speech, though it can be restricted for reasons mentioned above. At the end of the day it’s all about the type of country we are trying to build. As a Muslim Liberal I may have a personal religious opinion regarding gay rights or the limits of free speech in a Muslim country. However, I want to live in a confident Muslim country where we are able to discuss these topics freely and none of them are off limits. Just as Egyptian Liberals have nothing to fear from Islam, Egypt has nothing to fear from its Liberals. I wish to thank Mr. Rushdy for his thoughtful and original critique and the FJP for making a responsible decision regarding their use of religious slogans. I also wish to thank Sara Labib (@SaraLabib), an Egyptian law student and fellow Liberal for her advice and her valuable contribution to this article. Tamer- The problem with your argument is that you **will** become defenseless when further attacks on freedom of speech, including on topics that as half controversial as homosexuality and religion-change. You are simply paving for a slippery slope. The wise thing to do is to advocate for freedom of speech (of all sorts, including for the right to religious sloganeering) and then refrain from making extremely controversial issues (e.g., homosexuality) your priority. That is what is called responsible but otherwise perfectly free speech. The same can be hope from religious parties. You’d hope to let them have that right and then **they** choose not to commit religious campaign sloganeering. They will then, very likely, still abuse that freedom of speech. But we don’t live in a static world. Actions and words have consequences. Religious extremism will then only win if we liberals fail to equally use our freedom of speech. And if they win on the short run, they won’t on the long. And that’s for many reasons that I won’t get into here. A subject of discussion for another time. What I know is that oppression of speech will fire back, if not now, later. I get into more details in an upcoming article that I will post here once it is published. Both the harm principle and the similar “offense principle” have been recognized in the legal systems of most countries. At a time in Egypt when Churches are being burned and lives lost, I think a censorship on religious slogans would be prudent. Again, I don’t disagree with you or Hatem Rushdy at all. Both of you make a valid argument. The question is how much of it is currently achievable. “Political” Islam is for morons.. full stop. In practice as Dr F rightly points out, there is not a single country on earth which has absolute freedom of speech and expression and so one CAN take a position of hard line liberalism AND make exceptions. Even in the Western and Northern European democracies, arguably the most liberal societies on the planet, there are limitations, most quite sensible, such as forbidding incitement to violence, and some verging on the ridiculous such as the illegality of disputing the 6 million figure of holocaust fame or forbidding wearing certain items of clothing. I too wish to live in a confident country where we are strong enough and sensible enough to discuss anything. I am honestly not sure which is the better path though. Would it be best for us to learn by trying and pay the cost come what may (after all can anyone remember one successful cost-free or even low-cost revolution?) or is it more prudent to have a road map drawn by some of us to guide the way forward? My gut goes with learn the hard way, my head with planning a path. If the argument is that allowing religious (basically Islamic) slogans risks offending, alienating or even putting at risk the Coptic minority, forbidding them may risk offending or alienating the Muslim majority thereby possibly increasing the risk to lives and churches! (My actual personal view is that we have a very low level of sectarian trouble in Egypt and that it is fueled by those who would not see us progress – my reasoning is simple, in the first twenty or so days post-revolution when not a single policeman was on the street, with practically no security presence anywhere; not one church was burned, not one! We also have evidence that the Alexandria church bombing was perpetrated or at least encouraged by State Security) but that is the topic of a future blog. On whether use of religious slogans constitutes political manipulation, I would add that ANY campaigning of any sort is a form of manipulation and alienates some and ostensibly monopolizes an ideology. Well, it is a difficult topic of course where there can’t be a clear yes or no answer. I appreciate Dr. T’s comments on how the specificity of each country and its culture/history should be taken into account. In Egypt, one could thus say that fear of sectarian violence would justify limiting free speech by law. However, when you start allowing for exceptions to free speech (which exist in virtually any society as Hatem Rushdy pointed out) based only on cultural considerations, then you are entering a dangerous zone in which ‘culture’ can become an excuse for worse violations of human rights. Same thing goes with the concept of ‘insulting religion’, there are varying opinions on what is criticism of religious opinions and what is downright insulting. Let’s also not forget that allowing something by law (or rather not forbidding it) doesn’t necessarily mean it will be done, society protects its own values that way.